First of all I want to wish my Hubby a very Happy Birthday. He isn't much of a puter guy and doesn't like too much info put on the weeb about himself so I am just going to say I wish you a Happy Birthday and many more. He is over the 50 mark now, where does the time go? how do we suddenly arrive at these numbers? As long as he stays young at heart and keeps me laughing and smiling, we are all good to go. He takes wonderful care of me and love him dearly. Next I want to show and share with you some info about these ATC's. Inka over at Altered Artifacts has an offer you can't refuse. If you go to the link I have provided here you will see all the info. Nothing to buy, nothing to do except make some art. That being said I got onto Inka's list of free collage sheets, when she got to my name she sent me an email and asked if I would be interested in doing some artwork pertaining to the collage sheet. 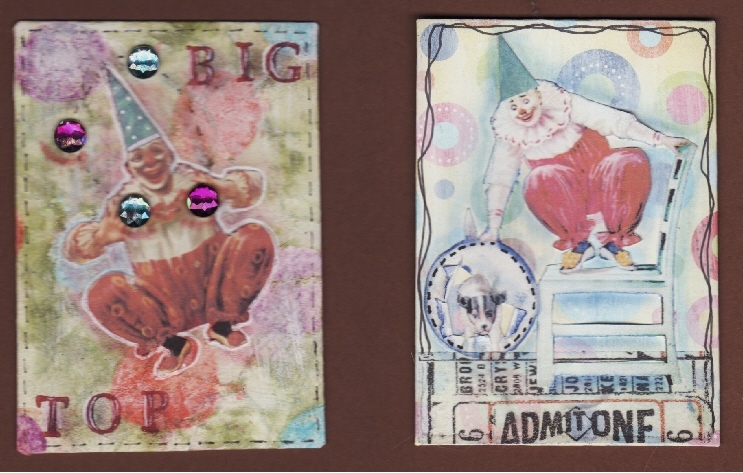 So....here are 2 Circus related ATC's that I did for her and they were a lot of fun. I actually had to tone down the backgrounds with a thinned out white acrylic paint so you could see the main image as the focal point. The little dog is jumping through that hoop and I cut away the paper around him and inked it and folded it back so make it look more realistic. I did one background in pastels," Big Top". I made big circles in different colours on white card stock. I scrunched up the paper, flattened it, then ran it under water then just touched the Peeled Paint distress ink over it to make it look a bit cracked. The oil pastels resist the ink...then I put the ATC size paper between some old sheets, you can use newsprint but I didn't want to get black ink from the print on it then ironed it for a few seconds so it would dry the paper. Cool huh? I placed my image on top, I found the background a bit too bold and lost the image so I then just lightly touched some white acrylic paint to it. Now that was happening. The second image with the dog, was just some scrapbook paper with lots different coloured circles on it, I did the same thing toned it down and then did the rest. These were so much fun and thanks Inka for allowing me to participate. Thank you for looking. Happy creativeness to you. Awesome artwork and what a great technique too! I love your ATC's they really bring a smile. Tell hubby a big HB from me too! Your husband must be Awesome because he has the same birthday as me! Turned 53 oh how it hurts to say that out loud. Happy birthday Lesley's husband! they look really cool Les and thanks for the link..